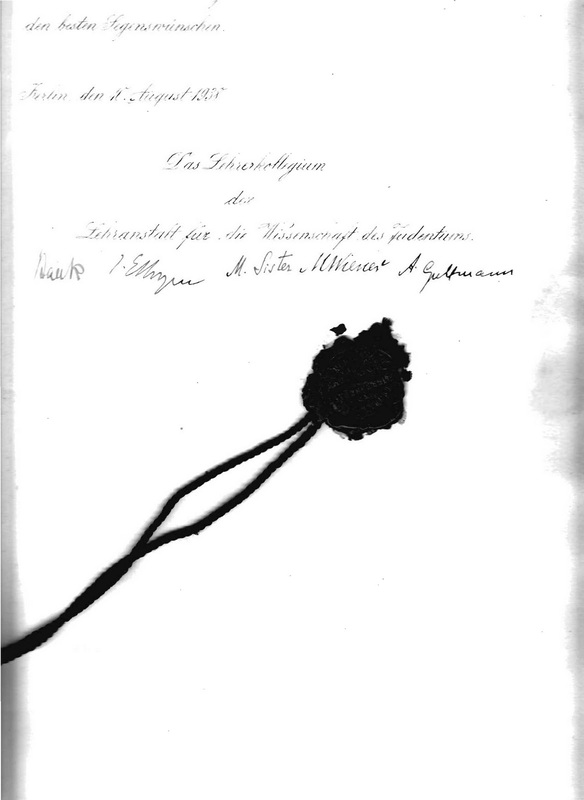 My father was able to continue his studies in prison, and, upon release, he was granted his ordination from the Hochschule fuer die Wissenschaft des Judentums. The text shows that he had completed the bulk of his studies by 1933, had served the Jewish community, but was granted the ordination in absentia in 1938, by which time, he was on his way to Czechoslovakia, out of reach, for a while, of the Nazis. Rabbi ,Preacher, and Teacher of Religion. 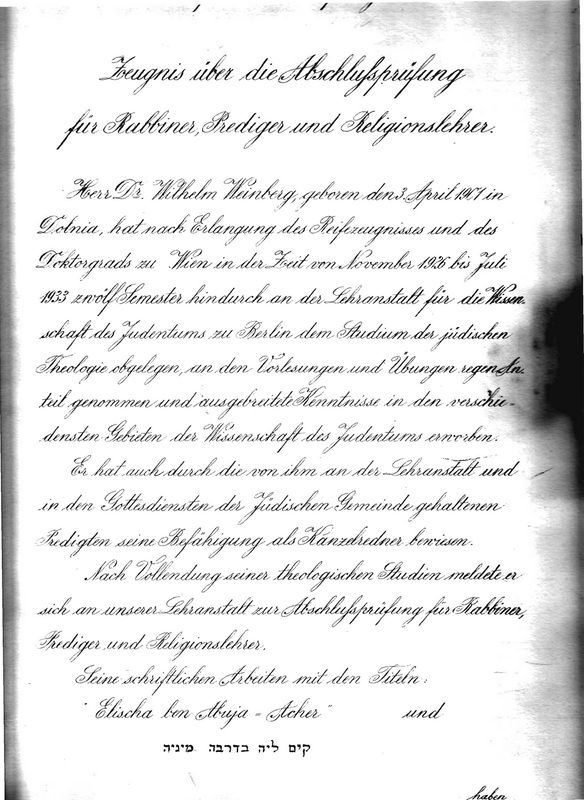 Dr. Wllliam Weinberg, born on April 3, 1901, in Dolina, has, after the completion of his Doctoral Studies in Vienna in November,1926, until July, l933, completed 12 semesters in the Institute in Berlin. He has completed his studies in Jewish theology and shown his ability in the Scientific Study of Judaism. Through this institute he has also served in the service of the Jewish community in many avenues and has demonstrated his knowledge of preaching. At the completion of his studies he took his final examination for Rabbi, Preacher, and Teacher of Religion. Kim Lei Bederaba Minei-( The Rabbinc principal of establishing a decision on a greater halakhic authority). Dr. Wilhelm Weinberg has received a grade of” Good: in all subjects. We affix our signature and the official seal as proof. We wish Dr. Willhelm Weinberg all the best. Berlin, August 10, 1938, The Faculty of rhe Lehranstalt fuer die Wissenschaft des Judentums. 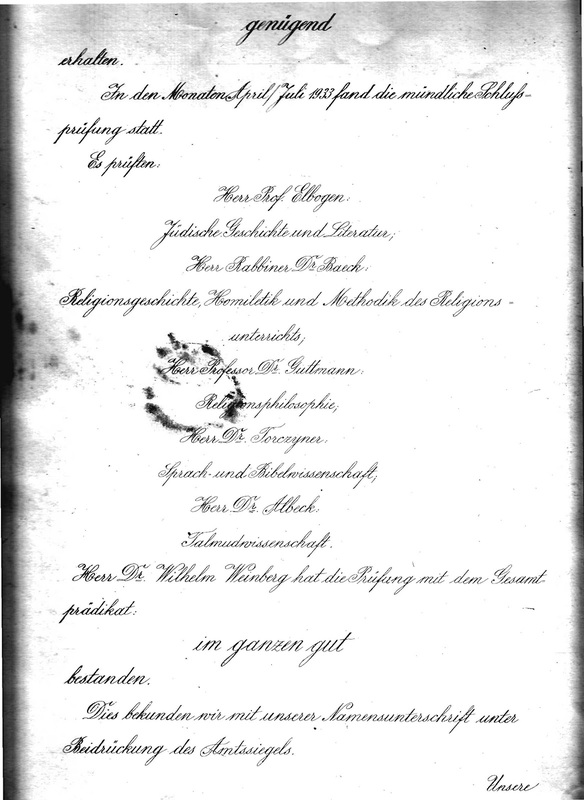 Baeck, I. Elbogen, M. Sister,M. 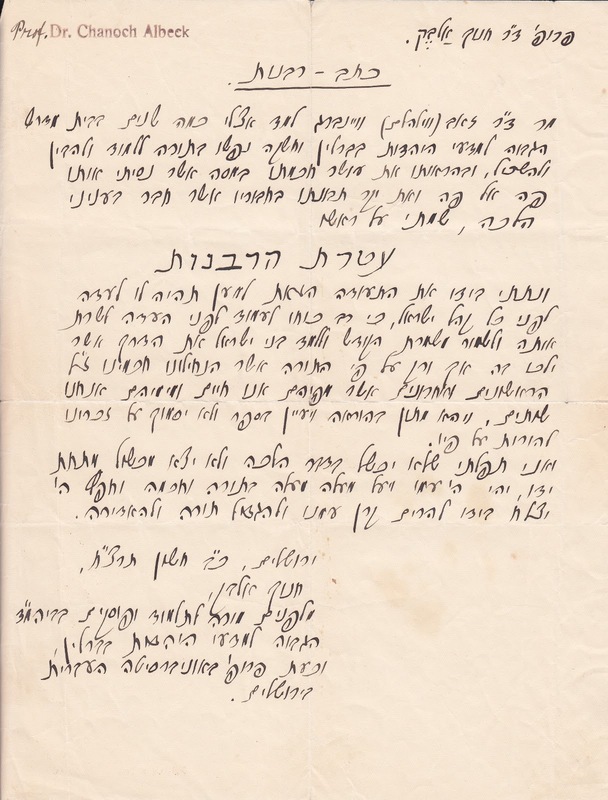 Wiener, A. Guttman"
Dr. Zeev(Wilhelm) , Weinberg has studied under me these several years at the Bet Midrash Gavoah LeMadaey Hayahadut (Hochscule) in Berlin.He has involved himself completely in the Torah, in order to learn, study, and comprehend. Based upon his display of the wealth of knowledge by examinations whereby I tested him orally and on the wealth of understanding shown through his essays which he prepared in the matters of halakhah(Jewish Law), I ordained him with THE CROWN OF THE RABBINATE. 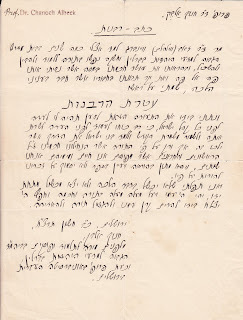 I have placed in his hand this document to be testimony for him in the presence of all the congregation of Israel, for great is his ability to stand before the community to serve it, and to stand sacred watch over it,to teach the children of lsrael the way whereby they should go, solely in the path of the Torah which our sages of blessed memory, both the ancient and the recent, have bequeathed us, through whose words we live and from whose waters we drink. May he be deliberate in judgement and examine the texts ,and not rely on memory alone for giving instruction.My prayer is that he never fail in the explication of halakhah and that there never be a stumbling block because of him. May the Lord be with him, and may he go higher and higher in Torah and wisdom. May God desire to grant him success in order to raise high the glory of our people to magnify the Torah and to make it great. des Judentums in Berlin, now Professor at the Hebrew University in Jerusalem"
Years later , I had the privilege of meeting my father's teacher in Jerusalem. He remembered my father for his exceptional mastery of the Hebrew language. Ten years of Rabbinical study, finally completed, would now be put aside for nearly a decade.